Busch 01007 Office building 2 floor extension - half price! Busch 01402 Tobacco barn - half price! Busch 01416 Garden bungalows - half price! 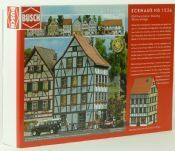 Busch 01422 Schonheide freight shed - half price! Busch 01439 Houseboat - half price! Busch 01477 Lamp storage building - half price! Busch 01512 Farm shop - half price! Busch 01557 Factory building - half price! Busch 01558 Warehouse with bridge - half price!